My preparedness focus for February is breakfast foods and emergency communications. It starts this Sunday. Using a monthly focus helps me stay organized and prevents becoming overwhelmed with the whole preparedness thing. The great thing about breakfast foods for food storage is they are affordable and you can eat them any time of the day in an emergency. My goal is to gather a 3-month food storage supply of shelf-stable everyday breakfast foods my family will eat. Even though I suggest specific items on my list to gather, adapt the list. Your family might eat cold breakfast cereal, whereas another family might want agave nectar and gluten-free buckwheat. Both families would be correct. 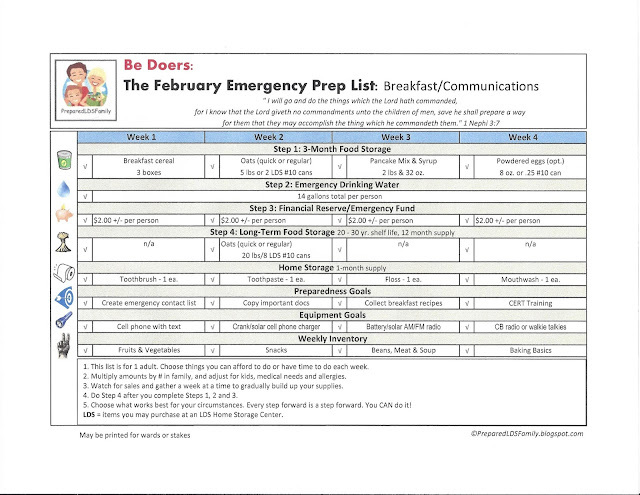 So, adapt my food storage goals for you. This month I'll gather breakfast cereal, oats, pancake mix, syrup and maybe some powdered eggs. I may throw in some extra boxes of food bars my husband likes too. I usually check the Costco ad to see if there is something on my prep list on sale. This month my toiletries focus is toothbrushes, toothpaste, floss, and mouthwash. Costco has the mouthwash my husband uses. Check! My other items are not on sale there, so I'll be going to another store for them. I'm surprised, Costo, since it's National Children's Dental Health month. Em and I are headed to the dentist in February for our checkups. Oh. Heads up. Even though I don't need them, you might want to know that Costco has their fire extinguishers, fire alarms and carbon monoxide alarms on sale. 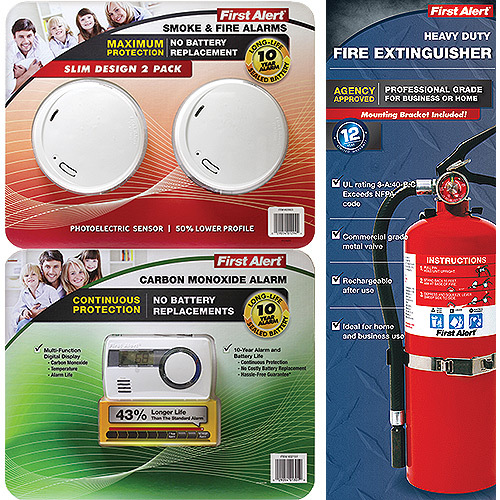 And the 9V batteries for the smoke alarms are on sale as well. Thanks, Costco. On Step 1: 3-month food storage supply of my list, you'll see oatmeal listed as 5 lbs. or 2 LDS #10 cans. You don't have to buy your 3-month supply of oatmeal in #10 cans. Nada. It's perfectly fine to store items for your 3-month supply in the boxed container from the store like the one pictured. I buy my oats from the LDS Home Storage Center, and then dump them in a plastic container for baking. Boy, would I like some oatmeal cookies right about now. Oh, yes. Back to writing. Don't get hung up on all the numbers on the list. It took a lot of research for me to figure out what works for my family. You may want to store more or less depending on how much you cook oats. Let's move on. Be on the lookout for some great breakfast cereal deals at the store this month. I actually picked up some General Mills cereals on sale Saturday. Not too many. Just six. My youngest does not like breakfast cereal. Yes, I know. She is unique. But my other children and grandchildren do like cereal. So, if they visit me, or if there is a disaster like a power outage or earthquake, I have something they can eat. I love granola and Special K. So, I have a variety of things always in my cupboard. Look for some store sales around President's Day weekend here in the U.S. too. Oats are amazing to store in your long-term food storage. They can be stored short-term in those Quaker Oats-type containers for something like 2 years, or long-term in #10 cans or buckets for about 30 years. But remember. Gathering food that lasts long-term is your Step #4. So work on that 3-month supply first. 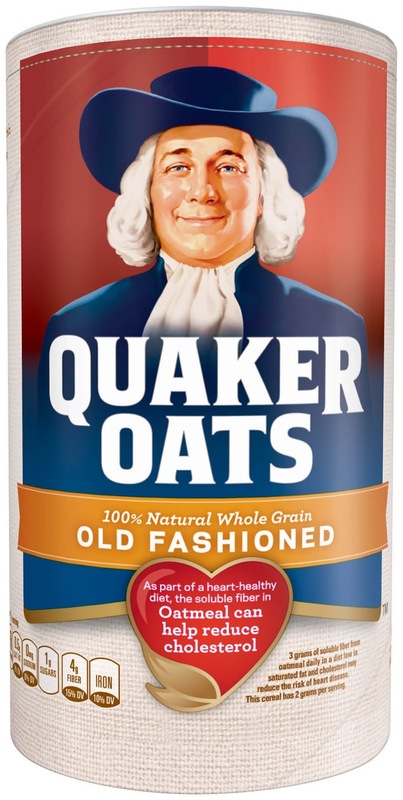 There are several types of oats, but most people buy regular, quick or instant oats. They are definitely economical. 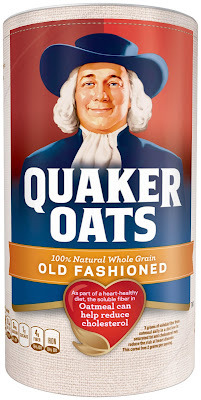 To understand the differences, check out this great article at Baking Bites: Regular vs. Quick Cooking Oatmeal. Let's talk about emergency communication. How will you communicate with your family during an emergency? Do you have some equipment to do that? What's your plan? Have you practiced it? Who is your out-of-state contact? Can you text them? Will they expect you too? What's your plan for Grandpa who lives 20 minutes away? Think it through. I've got to work on that too, since phone numbers and addresses keep changing in our family. We always think we are safe if our contacts are in our cell phone, but imagine if you accidentally dropped your phone in water after a disaster. Do you remember the phone number of your daughter who lives in San Jose? Perhaps it would be wise to keep a card in your wallet with numbers on it too. FEMA has a sample you can use, or create one of your own. Good luck on your goals this month. 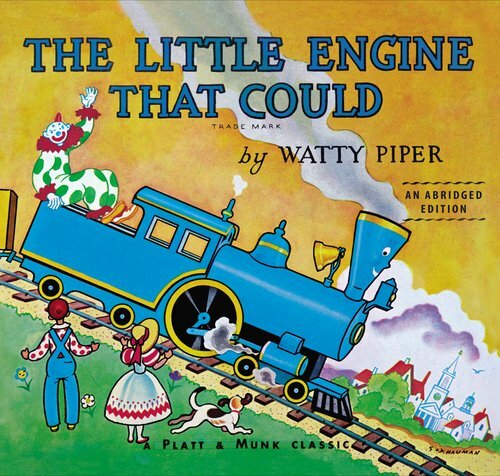 I think you CAN, I think you CAN one can or box or goal at a time. that they may accomplish the thing which he commandeth them." We go through so much oatmeal that we buy it in 50 pound bags and store the oats in food grade buckets. We go through 50 to 100 pounds a month. Depends on how much I use in baking. But to go with that is powdered milk and sugars. Almost all of us like brown sugar on our oats, but we also like white sugar. We also make granola with our oats, so having some oil to make that along with whole wheat flour and spices to make different flavors. Oatmeal can also be used in baking. Quinoa, is a seed that can be cooked like rice and used as a cereal. Millet can be cooked like rice also, and it comes out tasting like cornmeal mush. Again, sugar or syrup to top. We also add dried or fresh fruit. Remember that just about everything you buy in the store can be made at home, with some elbow grease. Yes it takes more time, but is soooo worth it. I just wanted to thank you for the Monthly Food Storage Shopping Lists. They are beautiful and extremely helpful! Thank you so much! I appreciate your work and your generosity with sharing your knowledge and experiences. I love these monthly storage goals!! Thank you for all your hard work!! I've been really stressed lately about food storage as I don't have a lot of money to spend on food storage. Also, I'm in the UK so haven't heard of some of the foods that are mentioned. Thanks for the link to the post about oatmeal. I have always wondered what the difference is. After reading your post, I've realized that I need to give more thought to breakfast in my food storage. 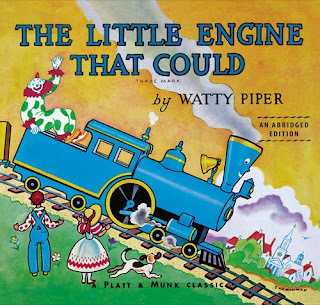 I have some things, but not a real plan, and I realized I am missing some important components. Thanks! Thank you for organizing this and breaking something so big into baby steps that don't feel so overwhelming. I found this list and am very interested in how you have everything organized. this will be easy to adapt for myself. thank you very much. looking forward to future posts. Did you click the link at the end of the post? I can see it when I do.